This page is VERY outdated. 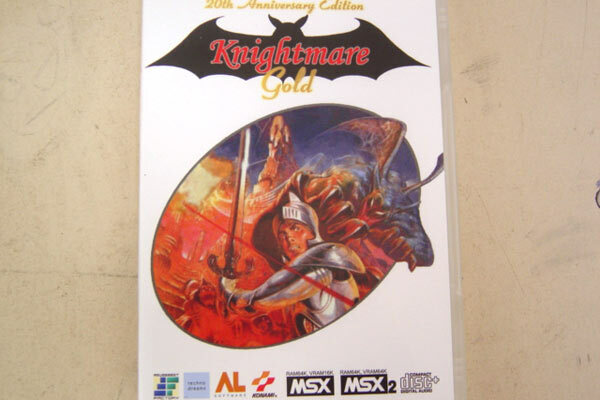 A direct comparison among original Knightmare, release Knightmare Gold and forthcoming Knightmare Gold 2.0 (colors were corrected to look like real MSX using RGB monitor). This is the stage 1 with new effects applied. This is the stage 4 with new effects applied. This is the stage 6 with new effects applied. This is the stage 7 with new effects applied. This is the stage 8 with new effects applied. This is the game cover (front), in a DVD box. Photo by Moacyr Alves. This is the game cover (back), in a DVD box. Photo by Moacyr Alves. 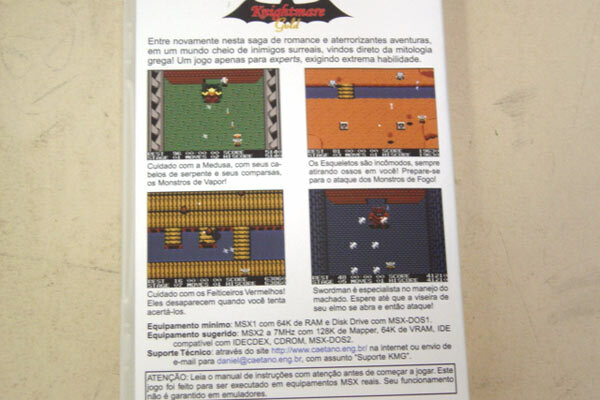 This is inside of game box, the game CD plus the 24 pages game manual. Photo by Moacyr Alves. This is the game loader menu. In this screen you can enable or disable whichever feature you want to, like CD music or new color palletes. The new Konami logo, on game opening. New opening screen... after color fade. 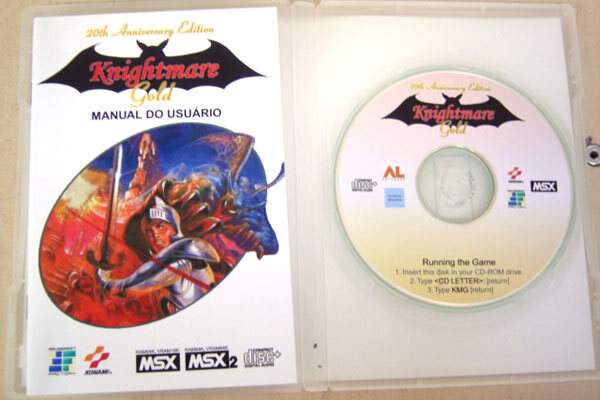 This is an example of a game screen in "Gold" mode. The screenshot doesn't show the smooth scroll effect nor the CD audio track, but allows one to see the partial results of this work. This is the same screen of the original game, so you will be able to compare and see the improvements. One sample from Enhanced color mode, with Smooth Scroll disabled and the alternative scoreboard layout. Notice the game colors are preserved in this mode, only enhanced by some shadows... and of course, the flickering is removed also. Another sample of Gold mode. The image shows Popolon fighting with Medusa, in the end of first stage. Gold mode again. Now the battle with Death is shown. Death was fully colorized. And Popolon weapons too. Gold mode. A sample from stage 3. Gold mode. Now a sample from stage 5: the fight with Swordman. Gold mode. A sample from stage 7, crossing the lake, before the last stage: Hudnos Castle. # New AdjustROM vesion. Now there is a new test function and it works in 64 bit Windows. # Corrected a bug on downloader that prevented CD files from being downloaded. # Download page updated with better info on finding KMARE.ROM. # KMGr3 was inclusing KMARE.ROM by mistake. The ROM was removed from the package. # KMGr3 - Midas Loader 3.0.0: SCC audio, river water animation, multi-IDE and CDROM support, improved CD player routines, more bugs corrected... second public release! # Corrected the problem with links in Music section. # Midas Loader 2.0.0: New music, last bug corrected... first public release! # Midas Loader 1.4.4: Corrected bug on IDE detection slot text. Corrected a bug that prevented Easy Mode in some configurations. Corrected a bug that prevented game to run without smooth scroll. Improved speed a little: replaced BIOS IRQ.